Use Facebook and Twitter messaging to service customers directly and increase customer satisfaction with Virtual Contact CenterA contact center that enables agents to be located in different geographical locations yet managed as if they were located in the same physical location. Social Integration. By unifying the agent experience, 8x8 Social allows users to channel their messages from social media into Virtual Contact Center. Customers can contact the businesses and receive support from within their social platform. Accept a chat interaction received via a social channel. View the screen pop for existing users in the Local CRM (The screen pop may trigger when the chat is offered). For new customers, the system creates a new customer record automatically. Interact with the customer, save the transcript to the CRM and end the chat. The chat transcript is saved as a closed case in the Local CRM. Access the chat transcript in the Local CRM. Initiate the chat conversation with the customer by typing in the chat window. Click Send. Your chat entry is posted on the customer's messenger window displayed on the social media page used to initiate the chat. Notice the name and Social ID of the customer are displayed to agents in the transaction panel. Optionally, insert information from FAQs. For details, learn how to Insert FAQ Responses into chat Interactions. Once you wrap up the chat, click the menu button just above the chat window to bring up the menu. Select Save to CRM to save the chat transcript as a closed case. It is automatically associated to the customer record that popped earlier. Note: You can save the transcript after ending the chat. It creates an independent open case. You need to manually assign it to the desired customer and close the case. Your status changes to Post Processing to wrap up. You can end post processing manually, or wait until the post processing timeout occurs. After ending the chat, if you haven’t already saved the chat transcript, you can save it. It creates a new independent case which needs to assigned to the desired customer record. Edit the chat log case as desired and save. If the chat request is from a new customer, a new customer record entry in the local CRM pops up. 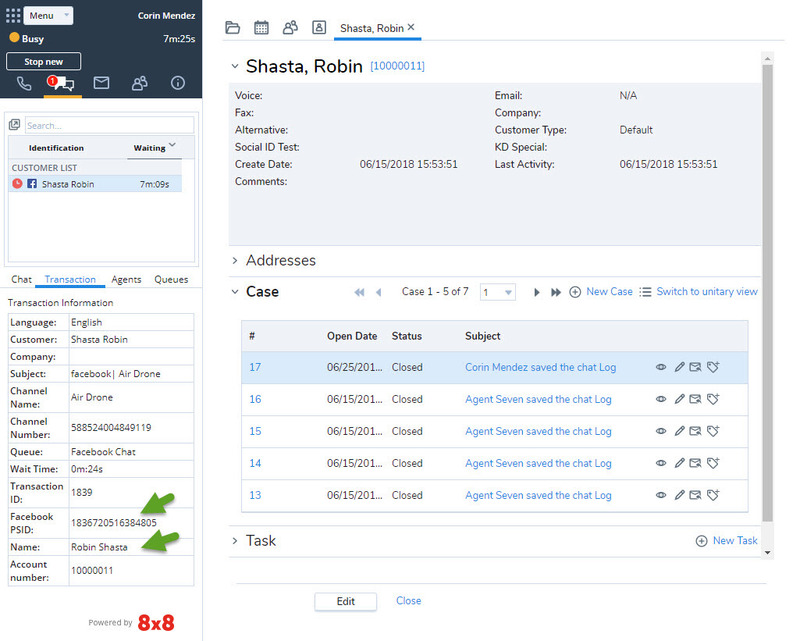 Enter the details of the new customer, and save the customer record. Supervisors can review all chat interactions in the playback section of the Monitoring tool.